JAKARTA, Indonesia - Littoral combat ship USS Fort Worth (LCS 3) arrived in Jakarta, Indonesia, Dec. 22 as part of a 16-month rotational deployment in support of the Indo-Asia-Pacific rebalance. The port visit is Fort Worth's first in Southeast Asia, and also marks the first LCS visit to Indonesia, an archipelagic nation that comprises 17,000 islands and the world's third largest democracy. Greeting the ship upon arrival were the U.S. Ambassador to Indonesia, Robert Blake, commander of U.S. 7th Fleet's Task Force 73, Rear Adm. Charlie Williams, and commander of Destroyer Squadron 7, Capt. Fred Kacher. Senior Indonesian Navy officials were also on the pier to greet Fort Worth. "Fort Worth's arrival in Jakarta is the first of many engagements she will conduct with regional navies while deployed to 7th Fleet for the next 15 months," said Williams. 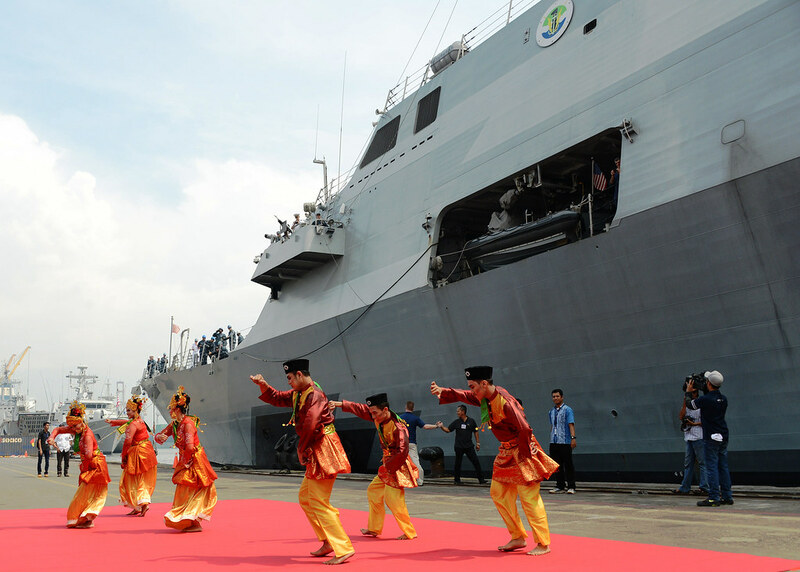 "This port visit also speaks to our strong and growing partnership with the Indonesian Navy." Southeast Asia is a textbook example of a littoral region and an area where LCS is uniquely suited to operate. With its maneuverability, high speed and shallow draft, LCS provides regular and routine presence in the region and access to places where larger U.S. Navy ships cannot go. Fort Worth is of comparable size to the warships operated by regional navies in Southeast Asia, and a major benefit of the platform is its ability to work with them during exercises like Cooperation Afloat Readiness and Training (CARAT). 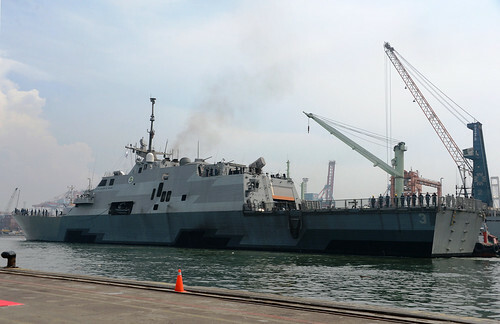 Fort Worth is scehduled to return to Indonesia in 2015 as part of the CARAT series. "Fort Worth's arrival in Jakarta is a new dawn for U.S. Navy operations in Southeast Asia," said Kacher. "As someone who has lived and worked in the region for the past two years, the question I consistently receive from our partners is, 'When is LCS coming?' With Fort Worth now here, and additional LCSs rotationally deploying to Singapore in the coming years, I can confidently tell our partners that LCS is here for good and she's ready to operate at sea with you." Fort Worth will employ the surface warfare (SUW) mission package for her entire deployment, augmenting her 57mm gun and rolling airframe missile launcher with two 30mm guns, two 11-meter rigid-hull inflatable boats, and two six-member maritime security boarding teams. Enhancing the SUW mission package is the embarked aviation detachment from Helicopter Maritime Squadron (HSM) 35, the Navy's first composite expeditionary helicopter squadron, which consists of one MH-60R Seahawk helicopter and one MQ-8B Fire Scout unmanned aircraft system. The Fire Scout will complement the MH-60R by extending the HSM-35's range and endurance, enhancing maritime domain awareness. "Our embarked Surface Warfare Mission Package provides us with significant capability," said Cmdr. Kendall Bridgewater, LCS Crew 104 commanding officer. "With two RHIBs and highly-trained boarding teams, LCS has the tools and skilled Sailors to train and operate with our partners as we work together to ensure maritime security." Since departing San Diego Nov. 17, Fort Worth transited the Pacific Ocean, and visited Hawaii and Guam. Following the Jakarta port visit, Fort Worth will head to Singapore, the primary maintenance and logistics hub for littoral combat ships rotationally deployed to 7th Fleet. The U.S. 7th Fleet conducts forward-deployed naval operations in support of U.S. national interests in the Indo-Asia-Pacific area of operations. As the U.S. Navy's largest numbered fleet, 7th Fleet interacts with 35 other maritime nations to build partnerships that foster maritime security, promote stability and prevent conflict.